As part of their roles in our current production in the Lawler, “Happy Ending”:, cast members Fanny Hanusin, Keith Brockett and Gareth Yuen have several conversations in Mandarin. They do it so comfortably that you could be forgiven for thinking they’ve been speaking it all their lives. But it’s actually a language they’ve only learned recently, with the help of Mandarin teacher Melodie Shen. 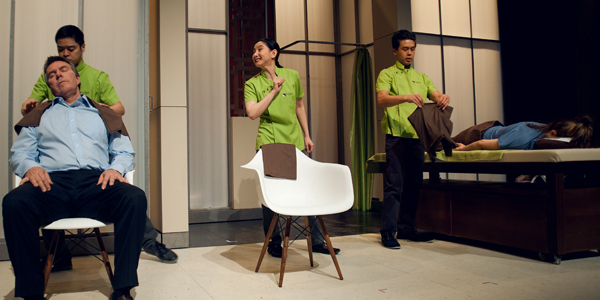 Keith, Fanny, and Gareth (in green tunics, left to right) learned Mandarin for their roles in Happy Ending. Also pictured, Christopher Connelly (left) and Nell Feeney (right, on table). Photo by Melissa Cowan. The trio – who hail from Indonesia, Malaysia and Australia respectively – met with Melodie every two or three days during the first two weeks of rehearsals, where they learned the basic composition of Chinese characters and words, some simple grammar structures, the 62-letter Chinese alphabet, and the all-important four tones. According to Melodie, people learning Mandarin for the first time often experience difficulty pronouncing these tones – which are the key to the language. It is so reliant on them that if you mispronounce one tone, your words can have a completely different meaning to the one you intend. But the cast handled the challenge with aplomb, coming up with clever tricks to memorise the sound of words and phrases. With the key sounds and important phrases under their belts, the cast focused on perfecting their characters’ Mandarin conversations from the script. There are more than 80 different dialects in China today – even Melodie’s parents speak different languages. She says that most Chinese people don’t speak standard Mandarin unless they work in particular jobs, such as TV announcers, Mandarin teachers and theatre actors. The majority of Chinese people speak Mandarin with a certain accent, and interestingly, so do our cast members. ‘Fanny and Keith’s Mandarin has a Szechuan accent, while Gareth’s sounds like a Hong Kong accent. I believe these have something to do with their mother tongues,’ Melodie said. In a relatively short space of time, the trio have gained a solid grip on the language – a fact that has made Melodie very proud.